More than half my writing by hand these days happens with an implement from Kaweco in Germany. They are brand new to me, but Kaweco has been making writing instruments since 1883. I’m especially eager to share my impressions of their outstanding LILIPUT fountain pen, but I’m saving that post for later. Here I briefly assess their SKETCH UP pencil. The SKETCH UP is a heavy beast. You will feel manly or womanly every time you pick it up to sketch. Its octagonal barrel somehow adds to its impressiveness. You simply cannot ignore its heft. Having used pretty much only No. 2 pencils my whole life–with mechanical pencils constituting my sole upgrade–the 5.6 mm lead felt mammoth, yet also softer and smoother than any other pencil I’ve used. 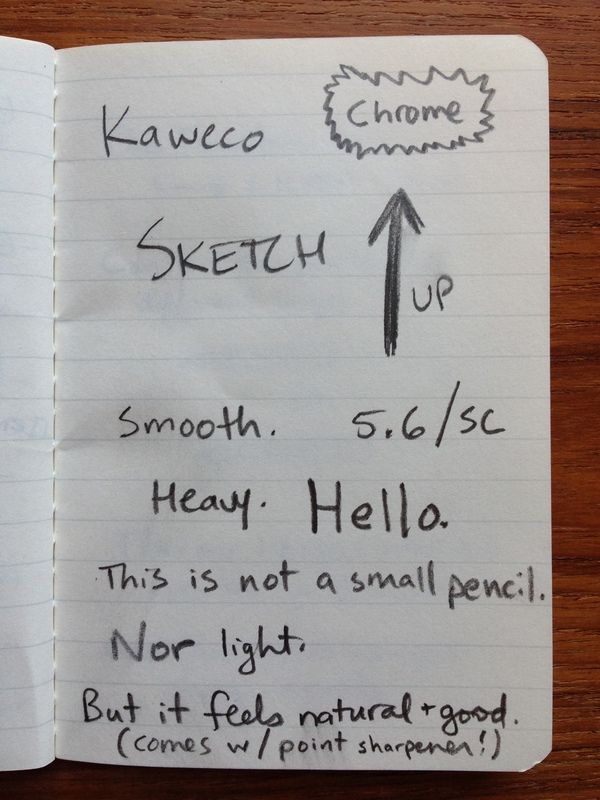 The SKETCH UP is not as long as your run-of-the-mill pencil, so it will fit into any pocket. I am only slightly embarrassed to admit it took me a few tries to figure out the mechanism that feeds the lead through. You have to push the button at the top of the barrel with one hand (to release the lead) and use another hand to adjust the lead to the desired length, before releasing the push button again. Then you’re all set to draw. Writing and sketching with the SKETCH UP feels great. Shading is easy and smooth. It’s maybe heavy for writing a lot of words, but even for taking notes, it would do well. Sketching, however, is its primary intended purpose, and for that it is a workhorse. And, get this: it’s got a built in point sharpener. The push button uncaps to sharpen your point. 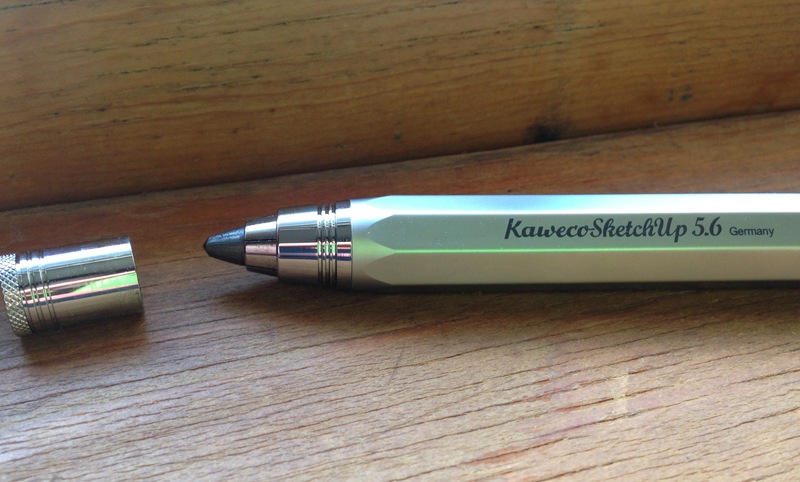 You can check out Kaweco’s SKETCH UP line here. (This pencil is Item #10000946, and came with a nice tin gift box.) And if you are so inclined you can order the SKETCH UP via JetPens or Most Wanted Pens. Many thanks to the fine folks at Kaweco for the pencil for review! Check them out here.